All home owners dream of having a beautiful driveway. It is no longer just an access road to one’s property nowadays but part of the whole house structure that should be well built and well thought of. Home owners nowadays often turn to installing a concrete driveway saying that it is what’s best for their homes and properties. But is it really? If you are planning to install a concrete driveway, your wallet may be in for a treat. Concrete driveways are often chosen for their solid surface which makes everything way easier. Whether it’s cleaning, shoveling up snow or maintenance, a solid surface is way much better than other types of driveways like cobblestones, granite or grass. It is also way much more expensive. There are generally two types of driveways which have solid surfaces namely concrete driveways and asphalt driveways. The thing about asphalt driveways is that they are the most popular choice for home owners who live in areas where snows are quite severe. Concrete driveways on the other hand, seem to outlast asphalt driveways in areas where snow is not severe. Having a concrete driveway is also a popular choice among home owners who are into decorating and designing their driveways. Lots of options are available for concrete driveways like concrete stenciling and concrete stamping which further enhances the material. Concrete driveways often do not look like plain concrete slabs but duplicates of other materials like bricks, tiles and cobblestones. However, these driveways are still made of concrete tweaked and made to look like other materials. This is what draws more home owners into installing a concrete driveway. With proper care and maintenance, a concrete driveway will relatively last long. Things like oil spills and exposure to changes in weather usually bother home owners with a concrete driveway. One of the ways to keep your concrete driveway in good condition is to tend to its cleaning and sealing. Always check the finish regularly and reapply whenever needed. Clean your concrete driveway most especially if it receives much traffic. If you’re looking for a concreter in Australia to install a concrete driveway in your property, then look no further! 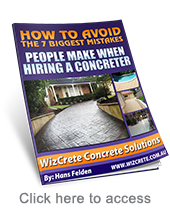 Wizcrete Concrete Solutions experts are the best and most logical choice for the job. With a triple guarantee and years of experience on the field, your concrete driveway will be done in a flash! Are you looking to resurface your driveway but have no idea how to do it? Worry not for Wizcrete can be the answer to your problem! Your driveway will be resurfaced in no time using spray on concrete. Spray on concrete is nothing new though you might be hearing about it for the first time as you are reading this article. Spray on concrete a process of applying concrete that eliminates the need for frame work. It can either be shotcrete (made of wet mix) or gunite (made of dry mix). Either types are ideal for they deliver the work faster and cheaper than the conventional method. Since there is no longer a need for frame work, the work time is drastically reduced and expenses for the framework is eliminated. Most studies even show that spray on concrete is superior to the conventional process of concreting as it provides good adhesion and bond strengths on top of saving time and saving money. Spray on concrete has quite many advantages compared to other types of materials for your driveway too. Firstly, spray on concrete is very low maintenance. Weeds and other unwanted plants will not grow on spray on concrete unlike in gravel and other driveway materials. Spray on concrete also provides a very safe, non skid and even surface for you and your family to drive in – eliminating potholes, cracks and other problems that non concrete driveways bring about. If you are planning on resurfacing your concrete driveway, contact Wizcrete and avail of the best concreting services in Sydney! Wizcrete is composed of highly creative concreters who can work hand in hand with you in coming up with designs that are not only impressive and eye catching but also efficient. Whatever budget and design you have in mind, Wizcrete’s highly qualified staff will be able to make do and deliver high quality spray on concrete for your driveway. Spray on concrete resurfacing in Wizcrete involves a variety of processes – ensuring only the best results for homeowners and clients like you. Thorough preparation like inspection of existing cracks, holes and rough edges before the spray on concrete resurfacing process begins is made sure of. Your spray on concrete resurfaced driveway is sure to last with proper maintenance and cleaning. Join hundreds of Wizcrete’s loyal clients now and experience high quality service from an award winning company! If your concrete driveway is suffering from cracks and holes, then all it needs is a good concrete resurfacing from Wizcrete. Wizcrete has made significant impact in Australia’s concreting industry – even bagging 2010’s Business Achiever Award and 2012’s Highly Recommended Australian Achiever Award. At Wizcrete, concrete resurfacing will always be at its best. 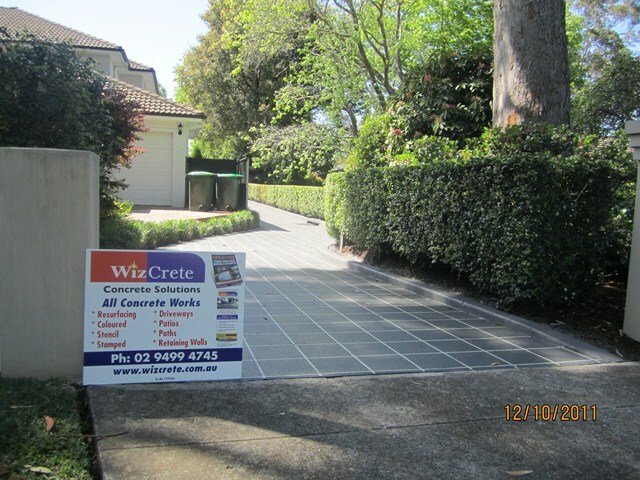 Wizcrete offers three options for concrete resurfacing in Sydney. The first option is through decorative stencils where homeowners like you can use your very own stencils in resurfacing your cracked driveway or paving. Another option is through overlay which achieves the looks of bricks and even natural stone without having to be one. It is currently one of the most in demand and famous choices for homeowners in Sydney and other parts of Australia. The last option for concrete resurfacing in Wizcrete is through spray on paving. The whole process restores the polymer in existing concrete surfaces and comes in a variety of colors and shades. The good thing about concrete resurfacing is that it can give your driveways and paving a whole new look without having to spend too much. Instead of replacing the whole driveway or paving, concrete resurfacing only creates a brand new layer which can be customized according to what you want. Of course, before concrete resurfacing, Wizcrete addresses the underlying problems like cracks and holes to ensure that the resurfaced driveways and paving are safe for you and your family to drive and walk in. In other more traditional methods of concrete driveway repair, the whole concrete driveway is taken out and broken away. Over time, concreters have found a very labor, time and cost efficient way of solving cracks, holes and whatnots in concrete driveways. There will no longer be a need to haul away the old material but instead reinforce it and use it as base. This is exactly what happens in concrete resurfacing. Concrete resurfacing at Wizcrete is done by highly qualified professionals who know how to distinguish between reparable and irreparable concrete driveways and paving. Some contractors insist concrete resurfacing even though structural problems of the driveway and paving exist. This is very dangerous as concrete resurfacing does not and will not be able to address structural problems. It will only be able to banish minor problems that can be solved with certain repair materials. At Wizcrete, client welfare is of utmost priority. Planning for new driveway designs requires creativity and practicality. Planning is even more difficult when homeowners have no particular driveway design in mind. Here are a few things to consider when planning for driveway designs. The distance from the driveway entry towards the garage or parking area highly determines the available designs you can push through with in your driveway. If the distance from the driveway entry and the parking area or garage is quite short, you might not have a lot of options but just to make a short direct route. If the distance is quite longer, there are more designs you can adopt such as circular driveway designs, courtyard driveway designs and crossover driveway designs. Circular driveway designs are probably the most popular most especially if you have ample space. It is basically a loop, with one end coming from the street and the loop incorporating the garage or the parking area. The great thing with a circular driveway is that you can also choose several design elements to place in the middle. If you have more than one vehicle in the family, having a circular driveway might be quite tricky. Since traffic only flows in one direction, you would have to park in the correct sequence in order for the person who leaves early to get out of the loop first. This wouldn’t be a problem though if the loop is wide enough to accommodate two vehicles side by side – a problem addressed by the next driveway design. The courtyard driveway design is another popular choice for homeowners who have larger areas for the driveway. Unlike the circular driveway design which is only limited to accommodating one vehicle at a time in the loop, the courtyard driveway design allows for two to three vehicles in the loop side by side. Like the circular driveway design, one end also leads to the street. Another driveway design is the crossover. Crossovers have one side that serves as driveway entry, another side that serves as driveway exit and a crossover at the front of the property that serves as the garage or parking area. 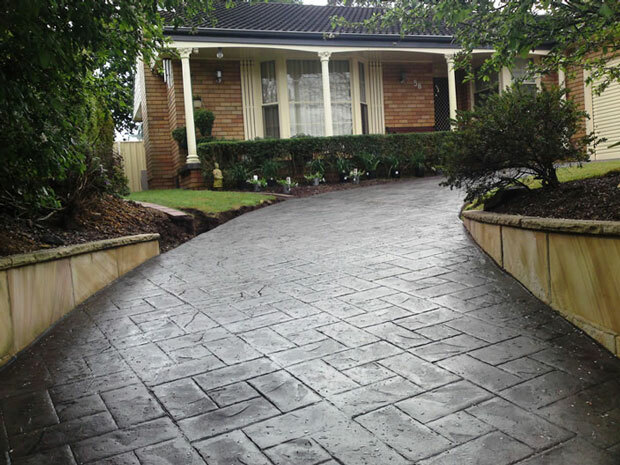 Whatever driveway designs you might have in mind, Wizcrete Australia will be able to make them a reality. Using only the best materials and performed only by the best craftsmen, your driveway is sure to be a hit with Wizcrete!